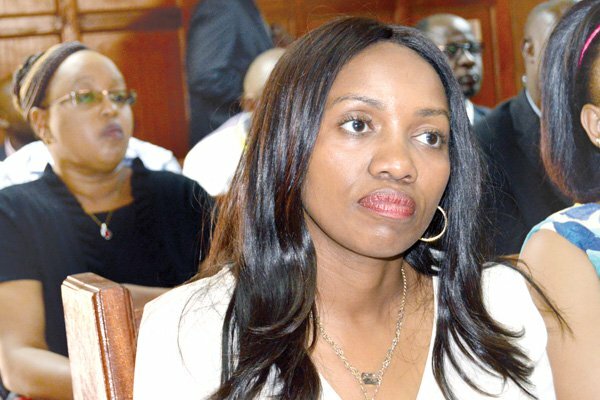 Monday April 15, 2019-Nakuru Senator, Susan Kihika, has finally spoken after the government of President Uhuru Kenyatta withdrew her security detail on Friday evening. Kihika was among four Jubilee Party leaders whom their security were withdrawn for reportedly campaigning for Deputy President William Ruto’s Presidential bid in 2022. The four are;Kihika, Kiambu Governor, Ferdinand Waititu , Kikuyu MP , Kimani Ichungwa and Kandara MP, Alice Wahome. Commenting on social media about the withdrawal of her security detail, Kihika who is a close ally of Ruto, said she doesn’t worry because bodyguards mean nothing to her. “They took away my bodyguard to intimidate me. I decided I can actually be the Deputy President’s Bodyguard! Nothing is as powerful as an idea whose time has come,” Kihika wrote on her Twitter account. Uhuru is said to have issued the order to have the leader’s security detail withdrawn over what he termed as “premature 2022 campaigns”. that's the problem of having a brain of 3 month baby as the head of state, with an IQ of looting and doing the same cos nobody shares his illusions. where did retired Moi get him from? only the devil knows.